Unwarranted Temperature Adjustments: Conspiracy or Ignorance? Additional evidence of how te homogenization process has created an illusory warming trend and readers should visit other researchers on adjustments in Paraguay, Bolivia, Greenland and other, as well as my look at temperatures in Massachusetts where moose are migrating southward. I have also developed a lesson plan for high school students where they can use official government data to investigate how temperatures are adjusted. I began exploring data at other USHCN stations from around the country and realized that a very large percentage of the stations had been adjusted very similarly. 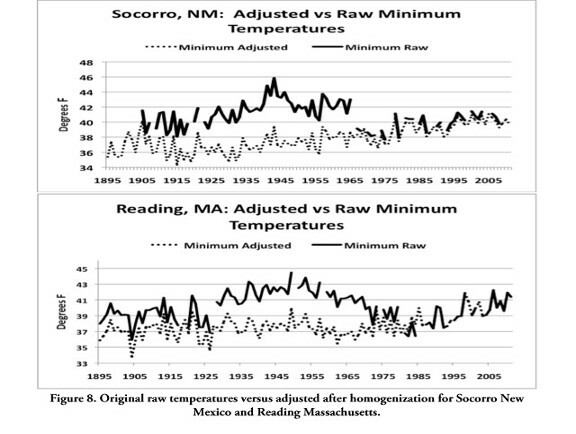 The warm peaks from the 1930s and 40s had been adjusted downward by 3 to 4°F and these adjustments created dubious local warming trends as seen in examples from other USHCN stations at Reading, Massachusetts and Socorro, New Mexico. For example even in relatively undisturbed regions, Yosemite’s varied landscapes respond in very contrary ways to a weakening of the westerly winds. Over a 10-year period, one section of Yosemite National Park cooled by 1.1°F, another rose by 0.72°F, while in a third location temperatures did not change at all.16 Depending on the location of a weather station, very different trends are generated. The homogenization process blends neighboring data and obliterates local differences and then fabricates an artificial trend. Ecologists and scientists who assess regional climate variability must only use data that has been quality controlled but not homogenized. In a climate variability study, scientists computed the non-homogenized changes in maximum and minimum temperatures for the contiguous United States.12 The results seen below (figure b) suggest recent climate change has been more cyclical. Those cyclical changes parallel the Pacific Decadal Oscillation (PDO). When climate scientists first began homogenizing temperature data, the PDO had yet to be named, so I would like to suggest instead of a deliberate climate science conspiracy, it was their ignorance of the PDO coupled with overwhelming urbanization effects that caused the unwarranted adjustments by causing “natural change points” that climate scientists had yet to comprehend. Let me explain. Although urban heat islands are undeniable, many CO2 advocates argue that growing urbanization has not contributed to recent climate trends because both urban and rural communities have experienced similar warming trends. However, those studies failed to account for the fact that even small population increases in designated rural areas generate high rates of warming. For example, in 1967 Columbia, Maryland was a newly established, planned community designed to end racial and social segregation. Climate researchers following the city’s development found that over a period of just three years, a heat island of up to 8.1°F appeared as the land filled with 10,000 residents.5 Although Columbia would be classified as a rural town, that small population raised local temperatures five times greater than a century’s worth of global warming. If we extrapolated that trend as so many climate studies do, growing populations in rural areas would cause a whopping warming trend of 26°F per decade. CO2 advocates also downplay urbanization, arguing it only represents a small fraction of the earth’s land surface and therefore urbanization contributes very little to the overall warming. However arbitrary designations of urban versus rural does not address the effects of growing population on the landscape. California climatologist James Goodridge found the average rate of 20th century warming for weather stations located in a whole county that exceeded one million people was 3.14°F per century, which is twice the rate of the global average. In contrast, the average warming rate for stations situated in a county with less than 100,000 people was a paltry 0.04°F per century.6 The warming rate of sparsely populated counties was 35 times less than the global average. In contrast to the population growth and explosive increase in tourism around Lake Tahoe, there has been very little growth in America's heartland. For example in Iowa Falls the population has hovered around 5,500 people for the past 60 years. Assuming no other major landscape alterations, without population growth increasing minimum temperatures, we would expect the maximum and minimum temperatures to closely parallel each other. Likewise without population growth in surrounding areas, we would also expect raw and adjusted temperatures to be very similar. And that is exactly what has been observed. It soon became obvious that the homogenization process was unwittingly blending rising minimum temperatures caused by population growth with temperatures from more natural landscapes. Climate scientists cloistered in their offices have no way of knowing to what degree urbanization or other landscape factors have distorted each weather station’s data. So they developed an armchair statistical method that blended trends amongst several neighboring stations,17 using what I term the “blind majority rules” method. The most commonly shared trend among neighboring stations became the computer’s reference, and temperatures from “deviant stations” were adjusted to create a chimeric climate smoothie. Wherever there was a growth in population, this unintentionally allows urbanization warming effects to alter the adjusted trend. Climate computers had been programmed to seek unusual “change-points” as a sign of “undocumented” station modifications. Any natural change-points caused by cycles like the Pacific Decadal Oscillation looked like deviations relative to steadily rising trends of an increasingly populated region like Columbia, Maryland or Tahoe City. 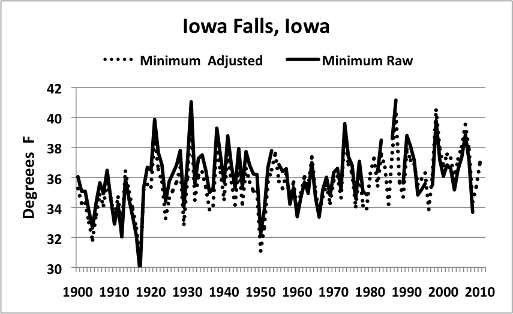 And the widespread adjustments to minimum temperatures reveal this erroneous process. I first stumbled onto Anthony Watts’ surface station efforts when investigating climate factors that controlled the upslope migration of birds in the Sierra Nevada. To understand the population declines in high-elevation meadows on the Tahoe National Forest, I surveyed birds at several low-elevation breeding sites and examined the climate data from foothill weather stations. 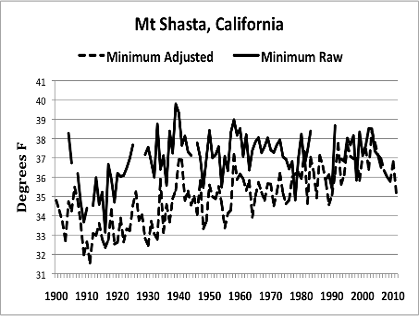 Marysville, CA was one of those stations, but its warming trend sparked my curiosity because it was one of the few stations where the minimum was not adjusted markedly. I later found a picture of the Marysville’s weather station at SurfaceStations.org website. 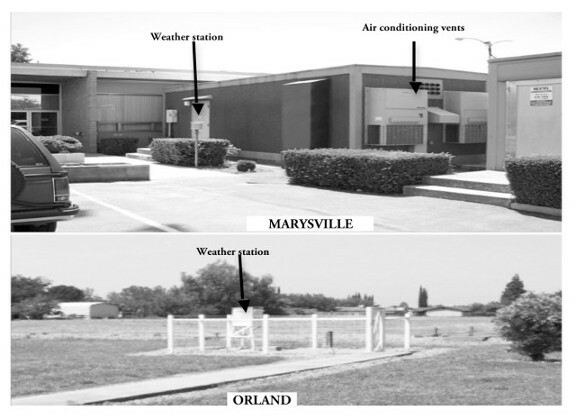 The Marysville weather station was Watts’ poster child for a bad site; he compared it to the less-disturbed surface conditions at a neighboring weather station in Orland, CA. The Marysville station was located on an asphalt parking lot just a few feet from air conditioning exhaust fans. The proximity to buildings also altered the winds, and added heat radiating from the walls. These urbanization effects at Marysville created a rising trend that CO2 advocate scientists expect. 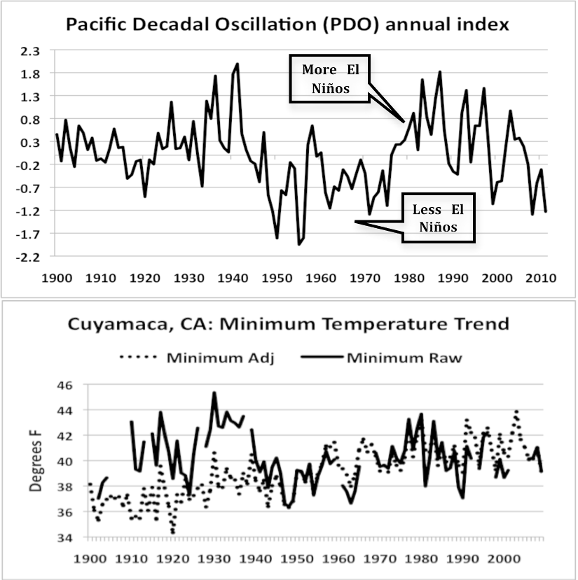 In contrast, the minimum temperatures at nearby Orland showed the cyclic behavior we would expect the Pacific Decadal Oscillation (PDO) to cause. Orland’s data was not overwhelmed by urbanization and thus more sensitive to cyclical temperature changes brought by the PDO. Yet it was Orland’s data that was markedly adjusted- not Marysville! That warning went unheeded. In the good old days, weather stations such as the one in Orland, CA (pictured above) would have been a perfect candidate to serve as a reference station. It was well sited, away from pavement and buildings, and its location and thermometers had not changed throughout its history. 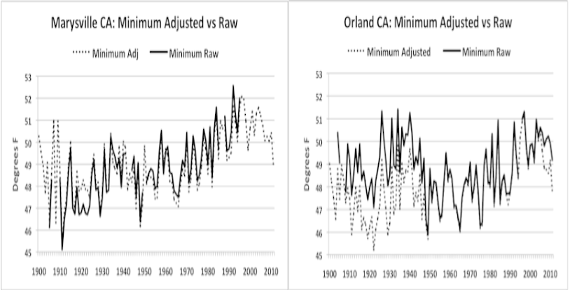 Clearly Orland did not warrant an adjustment but the data revealed several “change points.” Although those change points were naturally caused by the Pacific Decadal Oscillation (PDO), it attracted the computer’s attention that an “undocumented change” had occurred. To understand the PDO’s effect, it is useful to see the PDO as a period of more frequent El Niños that ventilate heat and raise the global average temperature, alternating with a period of more frequent La Niñas that absorb heat and lower global temperatures. For example heat ventilated during the 1997 El Nino raised global temperatures by ~1.6°F. During the following La Niña, temperatures dropped by ~1.6°F. California’s climate is extremely sensitive to El Niño and the PDO. Reversal in thr Pacific Decadal Oscillation caused natural temperature change-points around the 1940s and 1970s. The rural station of Orland was minimally affected by urbanization, and thus more sensitive to the rise and fall of the PDO. Similarly, the raw data for other well-sited rural stations like the Cuyamaca in southern California also exhibited the cyclical temperatures predicted by the PDO (see lower panel). But in each case those cyclical temperature trends were homogenized to look like the linear urbanized trend at Marysville. Marysville however was overwhelmed by California’s growing urbanization and less sensitive to the PDO. Thus it exhibited a steady rising trend. Ironically, a computer program seeking any and all change-points dramatically adjusted the natural variations of rural stations to make them conform to the steady trend of more urbanized stations. 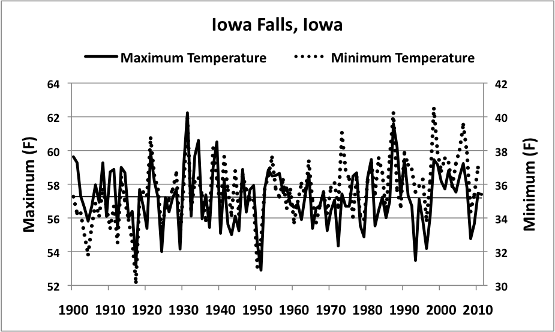 Around the country, very similar adjustments lowered the peak warming of the 1930s and 1940s in the original data. Those homogenization adjustments now distort our perceptions, and affect our interpretations of climate change. Cyclical temperature trends were unwittingly transformed into rapidly rising warming trends, suggesting a climate on “CO2 steroids”. However the unadjusted average for the United States suggests the natural climate is much more sensitive to cycles such as the PDO. Climate fears have been exaggerated due to urbanization and homogenization adjustments on steroids. However contrary to Trenberth’s email rant, the PDO continued trending to its cool phase and global warming continued its “hiatus.” Now forced to explain the warming hiatus, Trenberth has flipped flopped about the PDO’s importance writing “One of the things emerging from several lines is that the IPCC has not paid enough attention to natural variability, on several time scales,” “especially El Niños and La Niñas, the Pacific Ocean phenomena that are not yet captured by climate models, and the longer term Pacific Decadal Oscillation (PDO) and Atlantic Multidecadal Oscillation (AMO) which have cycle lengths of about 60 years.”18 No longer is CO2 overwelming natural systems, they must argue natural systems are overwhelming CO2 warming. Will they also rethink their unwarranted homogenization adjustments? Skeptics highlighting natural cycles were ahead of the climate science curve and provided a much needed alternative viewpoint. Still to keep the focus on CO2, Al Gore is stepping up his attacks against all skeptical thinking. In a recent speech, he rightfully took pride that we no longer accept intolerance and abuse against people of different races or with different sexual preferences. Then totally contradicting his examples of tolerance and open mindedness, he asked his audience to make people “pay a price for denial”. Instead of promoting more respectful public debate, he in essence suggests Americans should hate “deniers” for thinking differently than his fellow CO2 advocates. He and his ilk are fomenting a new intellectual tyranny. Yet his “hockey stick beliefs” are based on adjusted data that are not supported by the raw temperature data and unsupported by natural tree ring data. So who is in denial? Whether or not Gore’s orchestrated call to squash all skeptical thought is based solely on ignorance of natural cycles, his rant against skeptics is far more frightening than the climate change evidenced by the unadjusted data and the trees. 4. Karl, T., et al., (1988), Urbanization: Its Detection and Effect in the United States Climate Record. Journal of Climate, vol. 1, 1099-1123. 6. Goodridge, J., (1996) Comments on Regional Simulations of Greenhouse Warming Including Natural Variability. Bulletin of the American Meteorological Society. Vol.77, p.188. 8. Wilson R., et al., (2007) Matter of divergence: tracking recent warming at hemispheric scales using tree-ring data. Journal of Geophysical Research–A, 112, D17103, doi: 10.1029/2006JD008318. 10. 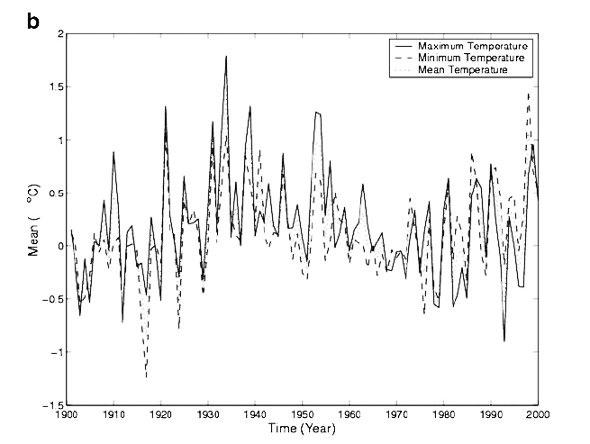 Youngblut, D., and Luckman, B., (2008) Maximum June–July temperatures in the southwest Yukon region over the last three hundred years reconstructed from tree-rings. Dendrochronologia, vol. 25, p.153–166. 11. Esper, J. et al. (2012) Variability and extremes of northern Scandinavian summer temperatures over the past two millennia. Global and Planetary Change 88–89 (2012) 1–9. 12. Shen, S., et al., (2011) The twentieth century contiguous US temperature changes indicated by daily data and higher statistical moments. Climatic Change Volume 109, Issue 3-4, pp 287-317. 14. Wang, X., (2003) Comments on ‘‘Detection of Undocumented Changepoints: A Revision of the Two-Phase Regression Model’’. Journal of Climate; Oct2003, Vol. 16 Issue 20, p. 3383-3385. 16. 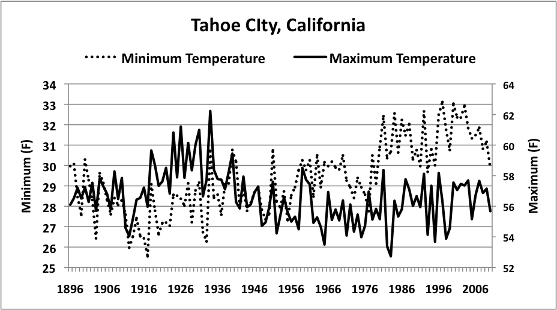 Lundquist, J. and Cayan, D. (2007) Surface temperature patterns in complex terrain: Daily variations and long-term change in the central Sierra Nevada, California. Journal of Geophysical Research, vol. 112, D11124, doi:10.1029/2006JD007561. 1. Does categorizing a weather station as rural mean human landscape changes have not increased the local temperature? 2. Why are minimum temperatuers more sensitive to local land surfaces? 3. Why would a rural station that has never changed location or instrumentation have its data adjusted?